Apple hasn’t updated the Mac Pro for almost 600 days. My 2008 Mac Pro is 1500 days old. I’ve been holding out for a new model; the wait has gotten so long I’ve even pondered whether just buying a second 15″ MBP would be an OK way to go. New form factor; no taller (wider) than 3U. The case should fit into 3U of rack space, even if it doesn’t come with rack ears. Eight 2.5″ HD bays for internal storage. Redundant power supplies (two would suffice, as long as the computer can run on one). RAM ceiling increase; at least 128 GB; 256 GB would be better. Four PCIe slots with two double-wide slots. Better video cards; support two 4 GB cards; four displays per card. 16 cores at the high end. The physical changes are easy: By nuking the optical drives, there is room for 6-8 2.5″ bays (on their side) in front of the power supply. By nuking the 3.5″ carriers, the case can lose about 1.25″, which is enough to drop the height under 19″, which gets rack-friendly. That still leaves the thickness problem–the Mac Pro is currently 8″ wide, but 3U is 5.25″ and 4U is 7″. Perhaps getting to 3U is too aggressive without adding depth to the case–30″ depth would be fine for racks but not as friendly for desktop use. I really want to see Apple start shipping 10gigE. The price is getting cheaper; switches from NetGear with four 10gigE ports and 20 gigabit ports were around $1,500 last I checked. Apple can help drive the price down rapidly. Somewhere around $12k nicely equipped (e.g., 8×512 GB SSDs, 96 gb of RAM, 8 cores, one 4 GB video card) would be great. You’ll note I didn’t mention anything about Thunderbolt; I just don’t care about Thunderbolt in a desktop system. No, I don’t expect Apple to ship this any time soon, but man I’d really like to have this system. 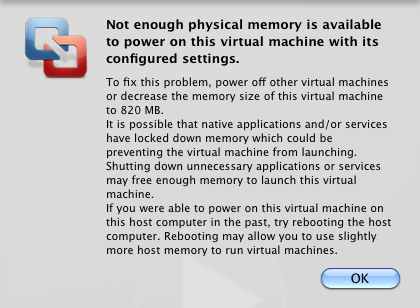 Running low on my 32 GB Mac Pro.